From "Blanche Tréguier." Used by permission, L. Tom Perry Special Collections, Harold B. Lee Library, Brigham Young University. 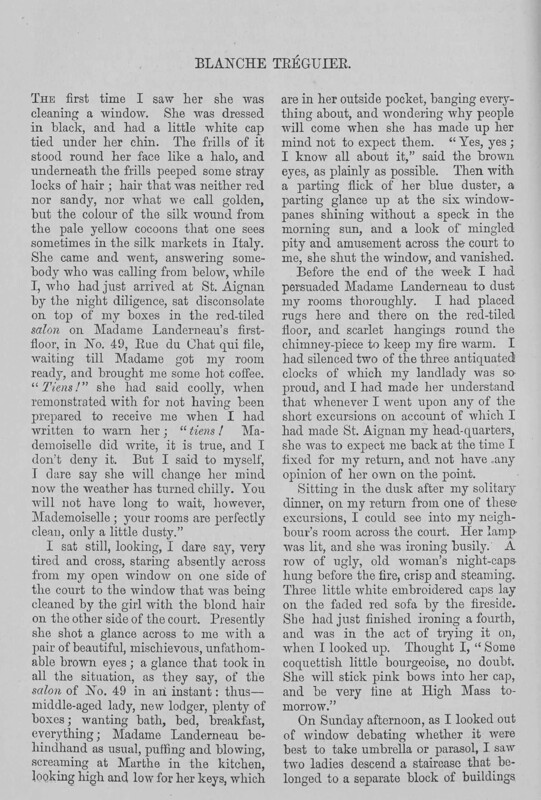 Introductory Note: “Blanche Tréguier” is a short story published in 1870 in Macmillan’s Magazine, a periodical with a middle to upper class audience. Narrated by a wealthy British expatriate, the story takes place in the town of St. Aignan in central France and follows the life of Blanche Tréguier, a young woman who is determined to pay the money required to marry Tristan de Kermartin, a soldier who would prefer to pay the "caution" money himself. The story explores the themes of courtship, genteel poverty, and the effects of war on soldiers and their families. I sat still, looking, I dare say, very tired and cross, staring absently across from my open window on one side of the court to the window that was being cleaned by the girl with the blond hair on the other side of the court. Presently she shot a glance across to me with a pair of beautiful, mischievous, unfathomable brown eyes; a glance that took in all the situation, as they say, of the salon of No. 49 in an instant: thus– middle-aged lady, new lodger, plenty of boxes; wanting bath, bed, breakfast, everything; Madame Landerneau behindhand as usual, puffing and blowing, screaming at Marthe in the kitchen, looking high and low for her keys, which are in her outside pocket, banging everything about, and wondering why people will come when she has made up her mind not to expect them. “Yes, yes; I know all about it,” said the brown eyes, as plainly as possible. Then with a parting flick of her blue duster, a parting glance up at the six windowpanes shining without a speck in the morning sun, and a look of mingled pity and amusement across the court to me, she shut the window, and vanished. Before the end of the week I had persuaded Madame Landerneau to dust my rooms thoroughly. I had placed rugs here and there on the red-tiled floor, and scarlet hangings round the chimney-piece to keep my fire warm. I had silenced two of the three antiquated clocks of which my landlady was so proud, and I had made her understand that whenever I went upon any of the short excursions on account of which I had made St. Aignan my head-quarters, she was to expect me back at the time I fixed for my return, and not have any opinion of her own on the point. On Sunday afternoon, as I looked out of window debating whether it were best to take umbrella or parasol, I saw two ladies descend a staircase that belonged to a separate block of buildings on the other side of the court. They had Prayer-books in their hands, and wore bonnets. They crossed the court and entered Rue du Chat qui file by the long narrow passage belonging to Madame Landerneau’s house. I did not see the face of the elder lady: the face of the younger was that of my ironing woman, my window-cleaner, the bourgeoisie with the brown eyes and the blond hair. But the bonnet on her head this afternoon told me in language not to be mistaken that she was no bourgeoisie, but a daughter of a good house, as they say at St. Aignan. I believe that at that time, had a bourgeoisie ventured into the street with a bonnet on, her neighbours would have mobbed her, and torn her head-dress into shreds. St. Aignan has the railway now, and gas, and flagged pavements, and many other innovations, and the bourgeoisies have left off observing their old sumptuary laws; indeed, I believe all the young ones wear bonnets and kid gloves on Sundays; but it was far otherwise at the time of which I write. One winter’s day, when the snow fell thick, and the white glare from the roofs filled and chilled my sitting-room beyond endurance, in spite of my scarlet curtains and my log fire, a timid, uncertain knock came to my outer door. Madame Landerneau and I had had a “difference” that morning about answering the door. She was paid for attendance, which she supposed to include getting my coffee of a morning, making my bed in time for me to get into at night, and stopping to have a chat whenever she brought me a letter or a newspaper. She had no objection to answer the door either, if she were in the way. If not—if she happened to be upstairs in her apple-room, or downstairs among her wine-casks, or nodding, or gossiping with a neighbour out of window—why, then any reasonable lodger would get up and answer the door herself. I had been roused that morning from a delicious sleep and a dream about a chime of bells, by a pedlar who had entered my room after knocking and ringing in vain at the outer door, and who insisted on selling me lithographs, and soap, and hair-pins, and brushes. After that it was necessary to come to an understanding with Madame Landerneau. “Oh, of course, since Mademoiselle insists upon it,” she said, and as she went away I heard her muttering to herself and grunting, “Ugh! as obstinate as a Bretonne!” Madame Landerneau was a Normandy woman, and believed no good thing could come out of Brittany. I sat still, wondering whether the door would be opened or not. After the third appeal to the bell I owned that Madame Landerneau had proved the stronger, and got up meekly to open the door myself. I was rewarded by seeing a princess in disguise—the girl with the brown eyes and the blond hair, hair that looked as if all the hairdressers in St. Aignan had been spending the morning over it. She stood and curtsied low, with mingled grace and pride, a princess if ever there were one. I curtsied too, and bid her enter. The letter was mine; my correspondent, a woman who never remembers street or number, and keeps no address-book. It is a wonder how any of her letters get to their owners. It was a wonder I got mine, then. Was she afraid I was going to claim relationship? Had she been Cornish, I should certainly have called her “cousin.” But I had not even Cornish cousins. I was without a relation in the world. I told her so. “If it is agreeable to Madame Tréguier, I will do myself the honour to make her acquaintance,” I said, feeling curious to know what the mother of my princess in disguise was like. Blanche Tréguier answered that her mother would be enchanted; but there was a want of alacrity in the tone in which she said the words which warned me it was possible Madame Tréguier would be anything but enchanted. Madame Tréguier, my landlady informed me, was a widow lady who kept the bureau de tabac—tobacconist’s shop, —tobacco being a Government monopoly, the places in which it is sold are not styled shops, but bureaux—in Rue de l’Epéron. She was as poor as a rat, but would take nothing from anybody, friends or relations; she preferred keeping her bureau and being independent, like a bourgeoisie. The girl was well enough, she always had a smile for you as she passed. But the mother was a regular Bretonne, proud down to the end of her skinny fingers. I found Madame Tréguier, indeed, very proud. Had it not been that Blanche, with all her pride, had a certain winsome way about her, I think I should have not repeated my visit. I believe Madame Tréguier considered me a doubtful character. I was a woman who lived alone, who had arrived at St. Aignan by the diligence; with plenty of boxes, it was true, but no maid. She did not know that I had only travelled in the diligence because I wanted to know what it was like, that I never intended to trust myself to it a second time, and that I had no maid because I had broken loose from my English Sarah after bearing her tyranny for fifteen years. Everybody was getting emancipated, and why not I? But I found the way to Madame Tréguier’s heart at last. One day I put on a wonderful cashmere shawl sixty years old, and paid Madame a visit in her bureau, where she sat in a cloud of smoke. She rose up quite flurried and distressed. I said I loved old things, and would like to see it. “Alas, I have it not,” she said, with a blush and a sigh. Some time afterwards I learnt that the shawl, along with other heirlooms of still greater value and antiquity, had been sold to her cousin, a Plouergast, and wife of the Préfet of Clermont, to enable her to send Blanche to the Sacré Cœur for a year. That year of schooling, just at the time of her first communion, was all the regular instruction the child had ever had. It was a comfort to poor Madame Tréguier to think that her property had not passed out of the family; and it was a comfort too to think that Blanche had for a short time been associated with girls of her own rank. The first communion was, naturally, an epoch in girls’ lives. They dated later events from it, and remembered in after-life who had been their companions on the first communion-day. Meanwhile, Blanche’s existence was dull and colourless enough. Her young companions of the Sacré Cœur had forgotten her. Now and then a friend of her mother’s, neither so poor nor so proud, nor perhaps her equal in birth, would spend a dull half-hour in the little sitting-room. Once a month Madame allowed herself a Sunday evening out, and then Blanche accompanied her to a whist-party at Madame la Présidente’s. But the poor child confided to me that she hated whist, and would stay at home, only that then her mother would have to carry the lantern herself. Poor things! their energies were all bent to the solving of the sad and difficult problem: How to look like gentlewomen on a thousand francs a year! We were in Madame Tréguier’s kitchen and Blanche was at her wash-tub when she made this speech. So these were all Blanche’s aspirations at eighteen! One spring morning, Blanche, who had been busy with her household work since five o’clock, came hastily into my sitting-room, exclaiming, “It is too detestable!” with a little angry stamp of her foot, as she stopped in front of me. “What is too detestable?” I asked coolly, rather amused at the proud little thing’s babyish petulance. Was it possible any one could have been rude to Blanche? I began in my turn to feel angry, and begged her to tell me all. By degrees I got her to tell me what it was. She had forgotten to fetch water from the well in the court the night before, and had been obliged therefore to go down that morning. She had waited till seven o’clock, because the servants belonging to the four families who took their water from that well would have got their supplies by that time, and if no one saw Blanche drawing water, no one would be reminded of Madame Tréguier’s want of a servant. I tried to persuade Blanche that the young man had only been moved by a proper feeling of compassion at seeing a young woman toiling upstairs with a heavy pitcher. But Blanche did not choose to take that view of the matter. One day, about a month after this, Madame Tréguier sent me a message to beg I would come to her in her bureau. I went down, wondering what could be her need of me; for, though by going there once I had in a manner established a claim on her friendship, I had never ventured there again, except to buy postage-stamps. She told me in little disjointed hurried sentences, while people were going in and out, —for it was market-day, and all the country people were getting their snuff-boxes and tobacco-pouches filled for the week, —that she had had an offer of marriage for Blanche, and that she was in a puzzle, and wanted to talk it all over. I knew well enough the comfort of being able to talk a thing over, so I ensconced myself behind the counter, and actually sold two sous’ worth of tobacco for Madame, while she told me what lay on her mind. The name of the young man was Tristan de Kermartin; he was a sous-lieutenant in a regiment of the line. He was as noble and as proud as the Tréguiers, “but, thank Heaven!” said poor Madame with a sigh, “not in such narrow circumstances.” But yet he was far from rich, and if Blanche married him, she would be obliged to be a careful housekeeper. M. de Kermartin had been most explicit as to his family and circumstances. The great hitch—that of Blanche’s want of money—he did not choose to consider a hitch at all. As for the caution-money required by Government before an officer is allowed to marry, he had offered to supply it all himself. When Madame Tréguier had said all she wished to say, I left her, promising to run in again in a day or two. She was going to see her confessor about it, she said, and should probably abide by his decision. I believe M. de Kermartin’s genealogy made her more inclined to him than anything else. When I went to Madame Tréguier’s two days after, I found the confessor there, and a young man, a good-looking fellow, who was M. de Kermartin. Then it was all settled! I thought Blanche had made up her mind easily enough, but of course it was no affair of mine. I felt glad I had heard all Madame’s talk without offering a single word of advice. I would not for any consideration have accepted the responsibility of that young creature’s weal or woe, in ever so small a degree. The wooing went smoothly enough, I believe, but I saw little of Blanche for some time. One day, when I was accusing her to myself of being fickle, and debating whether I would go and see her or stand upon my dignity and wait for her to come and see me, she came in suddenly, announcing that she had something very particular to ask me about. I did think of something else, to which Madame Tréguier was brought with some difficulty to give her consent. I found for Blanche a place as nursery-governess in an English family, where she would have forty pounds a year. Poor child! she danced for joy when I told her the situation was hers if she would accept it. I warned her that she would be homesick and worried, and vexed in a thousand ways; that she must make up her mind to endure without complaining. “I’ll care for nothing, so long as I earn this money for myself,” was her resolute answer. Four years after this, I went to St. Aignan to see the Tréguiers. Blanche was at home. Her employer’s children had grown beyond her teaching, and she was going to look for another situation. M. de Kermartin was there too; he had come to beg that there might be no further delay. War had been declared with Austria; his regiment might be ordered to Italy at any moment. Of the three thousand five hundred francs Blanche had set herself to earn, nine hundred were still wanting. He entreated Blanche to accept the nine hundred and make him happy. If the regiment once received orders to march, it would be too late. Blanche was immoveable. “I will never be bought for nine hundred francs!” she said, scornfully, when M. de Kermartin was gone, and I, feeling drawn towards him, began to plead his cause. Would she take the money from me? Call it a loan or a gift, as she pleased. I was ready and anxious to give it. All our arguments were thrown away, and I believe both M. de Kermartin and I left St. Aignan with our hearts feeling sore towards Blanche. He was ordered off with his regiment to Italy. My anger vanished, however, when Madame Tréguier wrote telling me that her daughter was wearing herself out with anxiety; and when Blanche wrote, confessing that she had been too proud, and that she wished, now it was too late, that she had taken my money. In August, I went again to St. Aignan. Then followed the days of Magenta and Solferino; days of illumination and speechifying and horrible carnage. 2Magenta and Solferino were the locations of two battles in the Second Italian War of Independence in 1859. Proclamations were made by the Maire.3“Maire” is French for “mayor.” The army had performed prodigies of valour. The inhabitants were invited to decorate their house-fronts and light up their windows; and “Vive l’Empereur!” cried the tambour and his following of ragamuffins. On one of these sad lit-up nights, when Blanche, after putting three wax candles in each window, had gone into her room to cry by herself, Madame Tréguier got a letter from the colonel of M. Tristan’s regiment. He had got his captaincy, he had got the cross of the Legion of Honour; for he, too, had performed prodigies of valour. And now, with a broken arm and a head cut open, the poor fellow had begged his colonel to write and ask Madame Tréguier and her daughter to meet him at Toulon.4Toulon is a city in Southern France. The invalids were being sent home, and he would be among them. She would have written to excuse herself from coming, but I prevented her. I made her understand that I wished to do something to show my regard for M. de Kermartin, and that my taking her place as her daughter’s travelling companion would show it sufficiently. There was a moment’s hesitation, but the request was put so as to shield her pride—it was not herself I was anxious to oblige—and she consented. That night Blanche and I set off; poor Blanche made no objection to taking my money now. I did what I could to cheer her up. The best thing was the travelling as fast as express trains and posthorses could take us to Toulon. Leaving Blanche at the hotel, I went to the Ministère de la Guerre to find out whether the invalids of M. de Kermartin’s regiment had arrived, and was told that a thousand, of which his company formed a part, would enter to-morrow. “Will the invalids walk, Monsieur?” I inquired in surprise. “Those that have legs will walk, those that have none will ride,” was the answer. Blanche’s spirits rose when I told her that M. de Kermartin would probably march with his company. “I ought to be thankful his legs are all right, at least,” she said. The crowd had receded; she and I were left alone. I took her inside the archway, and begged a corporal on duty to let us sit for moment on the bench. He was civil, and ordered a solider to fetch Blanche a cup of water. The man brought it in a tin cup. Blanche took it weeping: “Has my poor Tristan always had water to drink, even out of a tin cup, I wonder?” she said. I left her on the bench, and peeped out into the hot, glaring road. I saw a few poor stragglers on crutches. I went up to one of them and stopped him. “Tell me, mon brave,” said I, putting a gold piece into his hand, “do you know anything of M. le Capitaine de Kermartin?”6“Mon brave” means “my good man” in French. The poor fellow stared dully at the money; he was past being thankful. “M. le Capitaine is coming in waggon number three, if he is alive,” he said in a hoarse faint voice, and hobbled on after his comrades. We sat till the waggons appeared, and then we followed number three—Blanche giving a little gasp whenever a jolt or a roll occurred—on to the gate of the military hospital. I asked him to come with me to the hotel where Blanche was. I explained to her what his errand was, and left them together; for I felt that such a last message was not for me to hear. We waited long next morning at the hospital gate before the clock struck ten. It was at any rate better for Blanche to wait there than in our room at the hotel, fancying that my watch and the hotel clocks were wrong, and that she would be defrauded of one minute of the short interview allowed. We were conducted to a ward upstairs, and were just entering when a bell was heard ringing at the end of the corridor and our conductor bid us stand aside; the Host was coming. From every door in the corridor appeared figures, infirmary attendants, convalescents, Sisters of Charity, who all knelt as it passed. Our conductor followed, and signed to us to follow. “Who is it for?” I whispered. “Some officer who only came yesterday,” was the answer. The little procession stopped half-way down the ward, the Sisters of Charity knelt round a bed, we knelt too; such of the invalids as could move turned themselves on their narrow beds, and signed themselves reverently. “Thank God! it is not Tristan,” Blanche whispered, stealing her hand into mine. She remained on her knees till the little service was over and the priest had quitted the ward. “Let us go on now,” she said, as she rose comforted. The Sister who had been kneeling near us now came up and asked whom we sought. “Behold him!” she answered, indicating with her hand the bed on which the dying person lay to whom the last sacraments had just been administered. “Are you sure? Oh, ma sœur, it is impossible, M. De Kermartin is quite a young man,” we whispered both together. Blanche stepped forward, dragging me by the hand. She went close, then gave a cry and started back. “Hush, no noise!” warned the Sister. “My hair, my medal, my Tristan! O Tristan, Tristan!” the poor child cried, flinging herself down by the bed. Just then there came a change over the face of the sufferer. He opened his eyes, and seemed partly to recognise Blanche. “The ward is to be cleared instantly. Mesdames, you must go. Not one instant longer,” said the Sister, peremptorily, as Blanche prayed to be allowed to remain. As she took us out by one door, the surgeons entered by another. "Blanche Tréguier." Macmillan's Magazine, vol. 21, no. 126, 1870, pp. 534-42. Edited by Hannah Murdock. Victorian Short Fiction Project, 25 April 2019, http://vsfp.byu.edu/index.php/title/blanche-treguier/. 1. ↑ Tiens means “look” or “there you are” in French. 2. ↑ Magenta and Solferino were the locations of two battles in the Second Italian War of Independence in 1859. 4. ↑ Toulon is a city in Southern France. 5. ↑ The Porte d’Italie is a city gate in Toulon, France. 6. ↑ “Mon brave” means “my good man” in French.